With little time to recover from the Light & Building information overload, I headed almost immediately to the other reference event in the design world, Milan Design Week. Even though this year wasn’t Euroluce time (we’ll have to wait for next year to see the more design driven side of the lighting business) it is still very valuable and certainly inspiring to visit Milan. To discover what is new and up-and-coming, the Fuorisalone exhibits all around the city are the best places to go for your design food-for-thought. Outside of the commercial circuit, and perhaps because of that, you can find a lot of great examples on how brands and independent designers present their most innovative and risky propositions, which turn into trend setters. One of the must-see within this circuit is Ventura Lambrate, the hot-amongst-the-hottest Milan’s Fuorisalone neighborhood. Filled with adventurous designers and creative approaches, having a stroll around the multitude of exhibits present there will certainly tickle your brain and lift your spirits, such is the amount of beautiful things there. You can search for my twitter feed on Milan – look for the #milandesignweek and #milan2012 hashtags – to have a glimpse of the highlights that struck me during my visit. And, even though Milan is not the “light fair” city this year, you’ll be surprised to see how many lighting related bits of inspiration you could find there. One of the lighting highlights was an independent, upcoming furniture designer, Adolfo Abejón. You can check some of his work here or here. When he was presenting a small stand with his top designs within the Ventura Runway organization, I got the chance to pick his brains. It is always refreshing to ask this generation of new designers how do they see things we, long-time professionals, have been working on for such a long time, and discover new approaches and insights that might point us towards what the future of the area might be. So I thought I’d ask him about his designs, how he sees lighting and what is the primordial objective of designing light, and share it with you. Adolfo, what is your approach to lighting? Do you have a mission statement about the state of design lighting? We live in a time of transition in the lighting world where archaic forms give way to shapes inspired by the latest technological innovations. Although we have come a long way, there is still a complete mismatch between new light sources (light bulbs, LED, OLED, optical fiber, etc.) and fixtures. We find it impossible to adapt current bulbs to fixtures, and nowadays light sources still require expert skills just to install them. You could say we are witnessing a battle, a battle in which bulbs and fixtures fight against each other instead of going along together, and the majority of the lighting design we can find reflects this incoherence, this tension. I personally believe in the disappearance of some models of lamps for the sake of lighting being integrated into architecture, but we need to continue designing decorative lamps, with an objectual presence, to fulfill our emotional needs. Why did you decide to design decorative lamps? Human beings suffer from horror vacui, which implies the need to surround yourself with objects, thus decorating your living environment. Furthermore, decorative lamps not only allow us to soothe the anxiety produced by an empty space, but they are also essential in terms of its lighting (direct or indirect), because people can adapt their lighting by simply locating the luminaires where they want. Do you have plans to work with lighting integrated into architecture? Ideally, I would like to combine both approaches and work on how they can coexist and synergize in the future. And what about your vision? How do you see lighting going towards in the next years? In the future, I imagine light as a resource which is highly manageable, plastic, and adaptable to our dreams and needs. Currently light is mainly understood and controlled in terms of its intensity, reflection degree, color, and so on, but I think you can master its characteristic and its form and dispersal, to fully exploit its potential. Perhaps light will be applied only in the form of surfaces, or areas, as some sort of 'light windows', coming back to its intangible nature, and traditional fixtures are kept as sculptures, art, or nostalgic objects. How do you approach your task of designing light objects? I believe in giving the design to the people, to allow them to experiment with it, domesticate it, make it theirs. That sounds interesting… how do you achieve this in your designs? By breaking the luminaire archetypes you can bring them closer to the user. It’s a matter of stripping the design of the luminaire and showing its components and its truth. This way you engage the user with the object, they want to play and experiment with it. 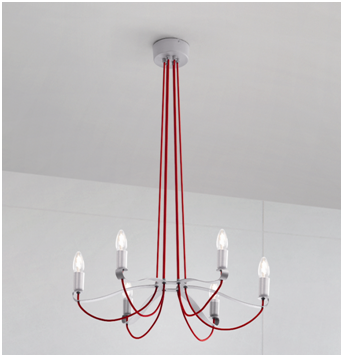 For example, a chandelier style pendant lamp is usually composed of arms, a central body and the necessary electrical installation is typically hidden. Why not exploit the potential of the technical elements and let them define the fixtures, instead of hiding them? A cable can be seen. A light bulb is pure. That is what I tried to achieve in my luminaire “Light” chandelier: bulbs and wirings define the lamp. In this design the user gives form to the lamp by simply adjusting the wires and so he/she feels he has transformed the object, owned it a bit more. One of my designs, the Slim collection, is a tribute to the bulb. A fine structure holds the bulb. Appealing to the emotional side, the silhouette of an archetypical shade is emphasized. Nostalgia is another way towards a new relationship of users with design. To finish, can you share with us some names of lighting designers that have inspired you? Louis Kalff and Achille Castiglioni. Toio, by Achille Castiglioni, is an honest and pure design. 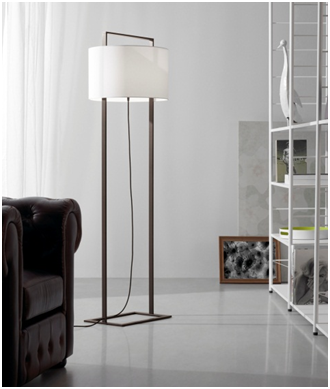 It is really inspiring to experience how the humble electrical components build this extremely sophisticated floor lamp. Louis Kalff designed this desk lamp in 1955 for Philips. His designs and legacy are simply art. I did originally post this article on the Light Community blog here.